A delicious low carb and keto mousse made with sweet mascarpone cheese and whipped cream. Topped with roasted strawberries, it’s an easy yet elegant dessert. Stop the presses! Hold everything! This, right here, right now, is a memorable moment. Take a deep breath, sit up straight and make sure you are paying attention. Because this is big, friends. This is noteworthy. This is historical. This, this lovely, sweet and creamy low carb dessert…this is the first recipe to come out of my new kitchen! We are out of our rental, into the new house, and it’s a sea of boxes. I don’t have a clue where most things are. I’m unpacking things I haven’t seen in 6 months and that I forgot I even owned. It feels a little like an archaeological exploration as I unearth artifacts of a bygone time and place. But the kitchen was priority number one for me and it’s mostly unpacked and nicely organized, although I do often stand bewildered in it, trying to remember where I’ve put everything. Let it be said that I never want to move again. Or at least for another 10 years. Given the chaos and uncertainty of moving, it’s a wonder I decided to tackle a new recipe so soon. But as I was walking home from the local farmer’s market the other day, arms full of 6 pints of Oregon strawberries, an idea popped into my head and I had to make it immediately. In part because it sounds so good and in part because I didn’t want the strawberries to go before I’d had a chance to execute it. And it worked out so well, I had to bring it to you immediately. I have other recipes ready to go but they are just going to have to wait. This one is a must make! Have you noticed all the recipes for roasted strawberries lately? It seems to be quite the trend. I have to say, I was a little skeptical because I don’t like cooked strawberries much. I love them raw and fresh but I find that cooking increases their sweetness so much it becomes cloying. But I was also intrigued because roasting brings out the best in some other foods, notably vegetables of the cruciferous variety. So, okay, I was willing to try it. But what to pair it with? I still had several containers of creamy mascarpone leftover from my Lemony Mascarpone Cauliflower Mac N Cheese. The Wisconsin Milk Marketing Board was not stingy with the gorgeous cheese they sent! I was kicking around the idea of mascarpone ice cream but the concept of a creamy mascarpone mousse just presented itself. When my heart quickened in excitement, I knew I was on the right track. And oh, how perfect a track it was! This stuff is gorgeous! It’s an elegant dessert and it sounds impressive but it’s remarkably easy to make. 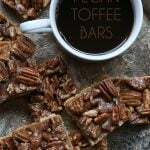 I think it might be my favourite low carb dessert recipe of late. And you know that’s saying something! Told you this was a memorable moment. 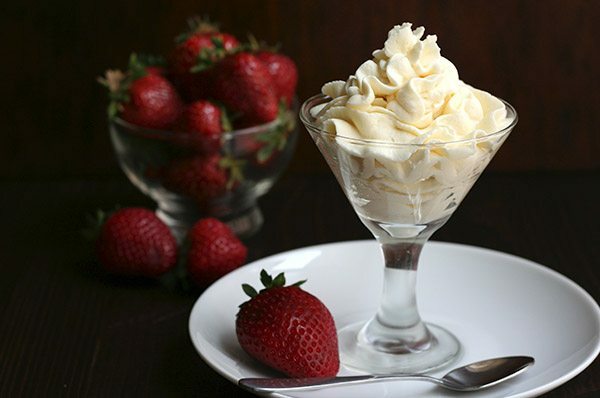 This creamy low carb mousse is made with sweet mascarpone cheese and whipped cream. Topped with roasted strawberries, it's an easy yet elegant dessert. Preheat oven to 375F and lightly grease a medium-sized baking dish (I used coconut oil spray). Add berries and sprinkle with sweetener. Add vanilla extract and toss to combine, then spread out over pan. Roast 20 to 25 minutes, until soft and tender and much of the juice has released. In a large bowl, beat mascarpone, cream cheese, 4 tbsp sweetener and vanilla together until well combined. In another bowl, beat cream with remaining 2 tbsp sweetener until it holds stiff peaks. Fold whipped cream into mascarpone mixture until combined. Pipe or spoon into 6 small dessert cups. Top with roasted berries and serve immediatly. Serves 6. Each serving has 6.24 g of carbs and 1.11 g of fiber. Total NET CARBS = 5.13 g.
This looks so good! I love making mousse using cream cheese but have yet to try mascarpone. Definitely try it, Erin. It’s amazing! This looks so good! Would the mousse hold in the fridge for a few days? Thank you!! Yup, it sure does. I have some in my fridge right now and I made it Monday. It has no eggs, so it’s not as iffy. Hi Carolyn- I’ve been following your website and books for quite a while now but have never contacted you personally. I just want to say how much I appreciate all the work and research you do to bring us such wonderful and healthy recipes. My husband was diagnosed as type 2 Diabetic a couple of years ago, mostly due to some harsh meds he was on while recovering from a heart attack. I too had always loved to cook but I was completely lost when faced with the daunting chore of re-learning how to cook for a diabetic. I began with baby steps, yours was one of the very first websites I found with such a wealth of info and ideas and I have kept “All Day I Dream About Food” as my go-to, favorite low carb food blog. I look at your site every day and I’m proud to say my husbands levels have steadily declined to the point he is now on the lowest possible dose of blood sugar med his Dr. can prescribe. It hasn’t been easy; I’ve had to prepare almost every bite we eat from scratch but the results have been well worth it & even though I did not have a problem with blood sugar myself, I am happy to say my own levels have also decreased substantially. I recommend your site to everyone I know and give you all the props in the world for helping my family improve our health and enrich our outlook on life! Thanks Again! Oh Janie, thank you so much for your kind words! So glad things have worked out so well for your husband. I have everything, right now, in my kitchen to make this except the strawberries. HA! A quick stop to the produce stand and I will make be making this tonight for dessert. It looks SO deliciousness. I just ate some of the leftovers right now. I can’t tell you how much I love this recipe! What did you use to pipe it with? Your photos look very elegant – would make a nice company dessert. I just used a Wilton tip like this one: http://www.amazon.com/gp/product/B0000VM48K/ref=as_li_tl?ie=UTF8&camp=1789&creative=9325&creativeASIN=B0000VM48K&linkCode=as2&tag=aldaidrabfo05-20&linkId=TP3VPA5SO2XYVEKO and some of their disposable pastry bags. You need to get the large ring and holder for it too. Not too expensive and easy to get at a craft store. It would make a fabulous company dessert, actually. I was saying the same to my husband. So upset!! Just bought whipping cream and when I opened it to measure it out, it was curdled! It wasnt expired either. Now I have to wait to finish making it this evening!! How frustrating. It was Horizon Organics brand. I already threw the carton away so I don’t know if there was carageenan in it or not. Oh well. I didn’t get a chance to stop by the store again so it looks like this will be happening tomorrow instead. I had the strawberries roasted and the rest of the mousse mixed up. Had to throw it all in the refrigerator. Glad it keeps at least! I tasted the batter and so far it’s really good!!! 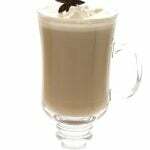 I’ve had whipping cream I thought was bad, but then realized it just needed to be shaken first. This looks amazing! Long time reader (like really long time) first time leaving a comment. I’ve been doing low carb for over 6 years now and I really wanted to thank people like you for doing these sites, as it helps out a TON when trying to meal plan. So thank you for taking the time to give to the community. I just started my personal blog http://www.joshloe.com which I plan to do the same on. It details my journey and ups and downs, if you’re interested. Again thank you for what you do! I just “found you” through someone I think is a mutual friend — Ellen Davis. So glad — your recipes look AMAZING! In this recipe, you shouldn’t have an issue subbing any sweetener you choose because it doesn’t rely on them for consistency. In some of my baked goods and frostings…that’s a lot harder. So I can use regular sugar? I LOVE, LOVE, LOVE this mousse! Super lite and creamy, not overly sweet its just right! My husband was ooing and ahing over it! It will be made A lOT at my house! Thank you for all the great recipes! This is so dangerously good! I can’t stop eating it!!! First of all, I am so happy that I’ve found your website. I have been following Dr. William Davis’s Wheat Belly for 6 weeks. 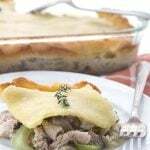 He has you listed as an additional resource for recipes in his Wheat Belly Cookbook. Thank you Dr. Davis! 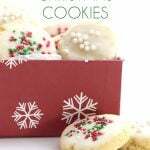 I needed inspiration and your link provides yummy recipes with excellent photography! 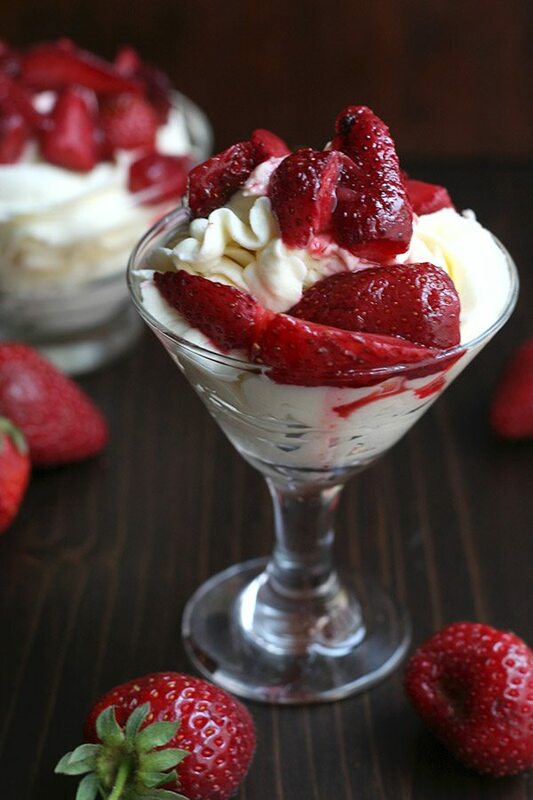 I just made this marscapone mousse with roasted strawberries last night and it was amazing!! I’ve made many of your other recipes and they are all so good! Thanks for introducing me to Swerve, as it is now my all time favorite sweetner and thank you for all your hard work! I’m definitely a follower!! So glad you like that one and other recipes too, Mai. This mousse will easily be one of my favourites. I can definitely see myself whipping up this dessert in the near future. It looks super delicious whilst being so simple to make. Love it. My entire family LOVED this! Will be making this again. Thanks for a great recipe!! I have no experience using alternative sweeteners, but when I needed to bring dessert to a luncheon honoring a lady living with diabetes you came through for me. I picked up a container of Truvia at the store and ran a bunch of it through my food processor to try and approximate a more powdered consistency. That worked well! I prepped the mousse at home and portioned it out into serving cups, then transported them to the luncheon in my cooler. When we were ready to eat I topped the mousse with fresh blueberries (since they are in season right now, and since you told me berries are better from a carb standpoint than stone fruits). Even the gal who doesn’t eat cream could partake of a bowl of fresh blueberries and wanted the recipe for her spouse. I’ve shared your blog with the whole group. Do you think I could sub creme fraiche for the mascarpone? 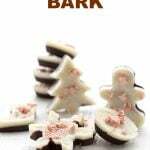 I really want to make these now, but my mascarpone went bad. Hmmm, mascarpone is more solid than creme fraiche and it also tastes a lot sweeter, without the “tang” of creme fraiche. Although I think it would be good, it won’t be the same and may be more goopy. Can you add a bit more cream cheese? What nice light dessert idea when we’re in the season of heavy foods. Thanks, and welcome to your new house! Every time I search low carb, you are my go to. Your recipes are delicious. I’m making this for a dinner party tonight and am sure it will be a hit. Thanks again and don’t stop publishing your great recipes. Made this yesterday and loved it! Didn’t have strawberries but sprinkled nuts and dark choc chips. It was is winner! Will it be okay to use regular sugar or powdered sugar? Maybe turbinado? This sounds too delicious to pass up! I used the powdered sugar and it came out grainy … not smooth. I have used mascarpone in the past and my desserts always came out smooth and creamy. I wonder if the culprit was the powdered sugar? I’ll have to try it again using the sweetener listed. Second time making these ,they are wonderful!!! 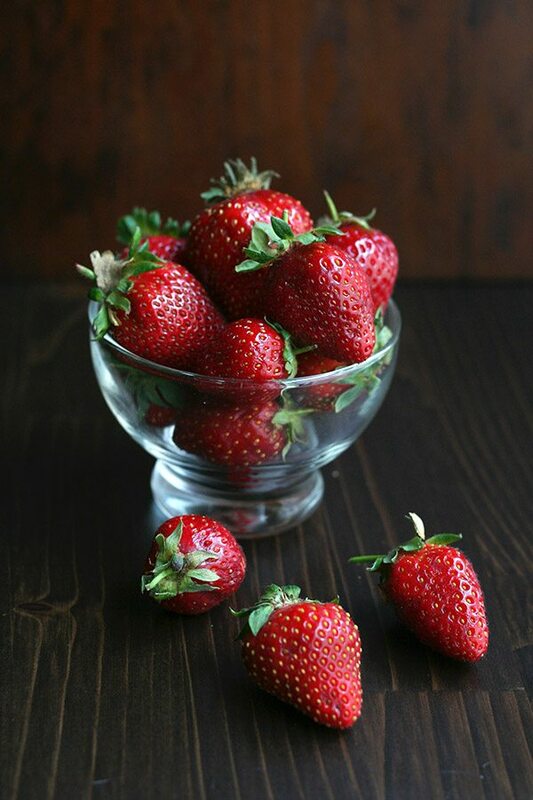 Can I use just fresh strawberries, not roasted? Will this effect the taste? It will be a different taste but still very good! 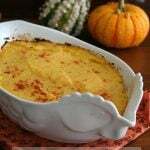 Wow!, this is good… at first I thought it was just going to taste like other “no bake cheesecakes” , but was pleasantly surprised it had a much different taste and was very light…. I just cut up some fresh strawberries to go on top…. it was the perfect ending to my night. Thank you for this recipe, I’ve made so many of your desserts and they always come out perfect and delicious. How would it taste if I left out the sweetener? Probably not very sweet but might be interesting. Thank you for all your dedication and hard work. I share your posts on my FB page for friends and family. I was wondering if whipped coconut milk would work instead of the whipping cream for my lactose intolerant family members. The cheese is fine for them so no worries there. Thank you again for all you do. Whipped coconut “cream” (the creamy part of the can of milk) should work. Make sure it’s VERY cold and chilled when whipping and adding to the mousse because it’s not nearly as stable as whipped cream. Delicious! I just made it and everyone had seconds. Thank you! Oh good heavens, this is incredible! My hubs, who is very anti-ketogenic tasting anything said this was as good as any he’s ever had. In fact, this tastes exactly like the full-calorie cheesecake filling, so I plan to make little keto tart holders and pipe this lushiness into them, and chill. A-maz-ing! I love it when we win over the non low carbers! Fabulous idea. I got a question about serving it immediately, particularly after you said in one of your comments it keeps well. But my question is about the strawberries. 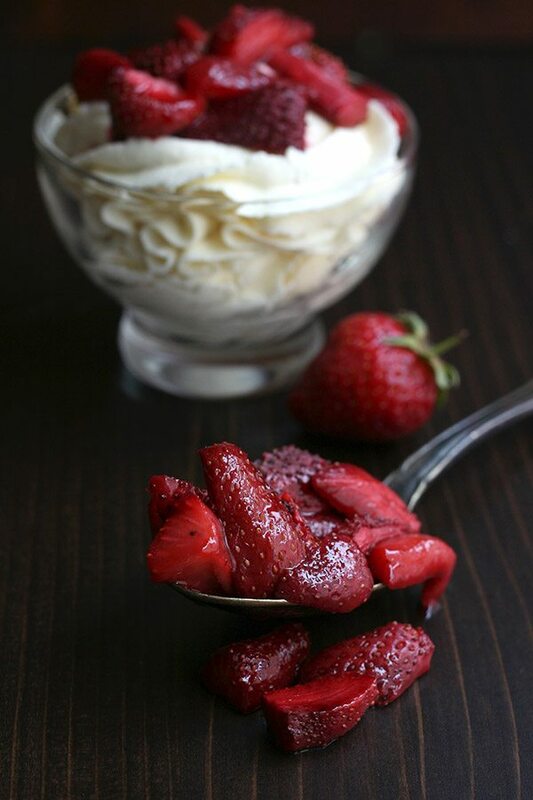 Are you recommending it be served immediately because the roasted strawberries are still warm from the oven? That sounds appealing. 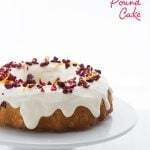 Also the recipe has prompted me to do something similar with peaches or cherries in brandy. The brandy’s optional but I think roasting the peaches or cherries could really help their sweetness. And pecans are in the mix there, somewhere. Probably a sprinkling on top. Yes, the mousse is chilled but the strawberries are warm, which is lovely! I Think i ruined it by adding mascarpone cream mixture to whipped cream instead of other way around…. ugggggg Any remedy? Did it curdle? If you have a little xanthan gum that might work. Beating in some cream cheese might help too. 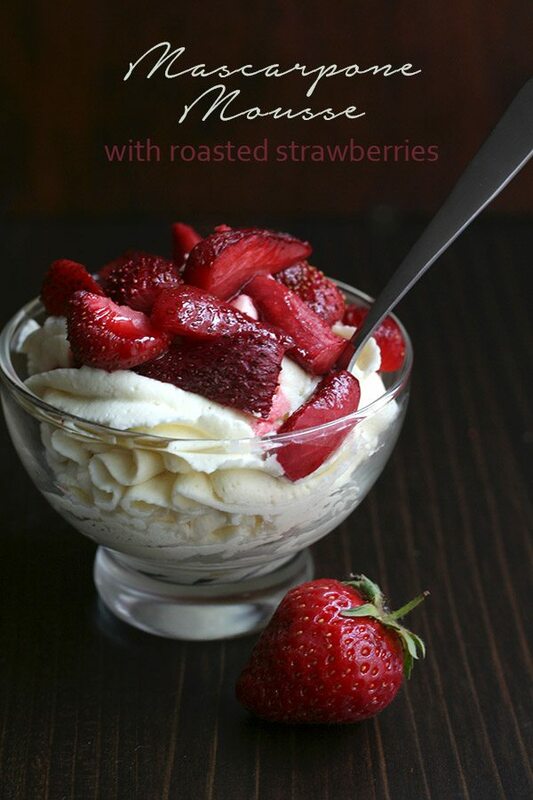 Those roasted strawberries make this extra special! Yum, this looks like the perfect strawberry dessert! Mmmm this sounds SO good! Roasted strawberries… wow! 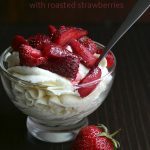 Love a great strawberry recipe and this mousse? To die for! great flavor from the strawberries! I’m pretty sure that this will be served in Heaven! So good!!!! Just made this. Was outstanding. I only used 3T Swerve in the cheese mixture and it was just sweet enough. Thank you. This has been in my “to make” list for quite a while. I will always regret that it took me so long and that I will never get those days back!!! Just delicious!!!! Oh my! You had me at the roasted strawberries! I must try this recipe! What a fabulous way to enjoy strawberries. This looks soo soooo tasty!! I can’t wait to try it! Oh my, I could so easily eat the entire batch myself, which kinda defeats the point of it being low carb, LOL! This looks heavenly! Roasted strawberries! Umm Yum!! The strawberries are included. Only if things are completely optional do I leave them out of the nutritional counts. Thanks so much. I plan to take this to my next cousins get-together. My daughter even eats this and she is not KETO. Absurdly delicious. We’re not even doing Keto or any kind of diet, nobody can complain about this being a weird ‘diet dessert’. I cheated a little, I live in Germany now, and instead of looking for artificial sweetners, I just added small teaspoons of powdered sugar and taste tested until it was what I liked. Instead of using 8 and 4 ounces specifically, I converted to grams and then rounded up to the closest available size packaging. This was really good, and maybe it’s just me, but I find it to be a good substitute for Cool Whip, especially since it holds form better and longer than regular whipped cream, but is still pretty airy. Just put them in the fridge! since there are no eggs, this should be good for 5 days as long as your cream and cheese were fresh. I’m a long time lurker on this blog, transitioning to a LC diet along with IF. I made this for our Saturday night dessert and we LOVED it. My husband had no idea it was LCHF. Next time I may have to swirl a little melted dark chocolate into the mousse. This is so yummy. I used less Steve and it was still sweet, rich and delicious!